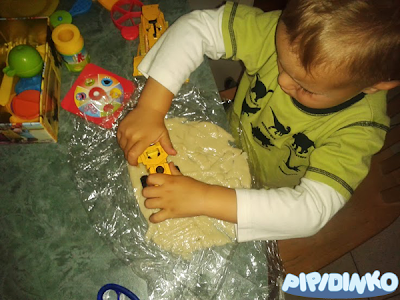 Santino enjoyed playing with a sheet of revived playdough, which didn't turn out so great and became sticky. 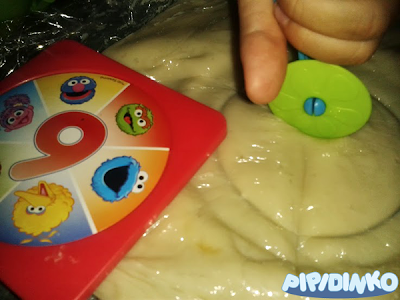 Here's how to make it: screw up the home-made playdough, put it in the plastic wrap. Enjoy! I lost one of my super powers. 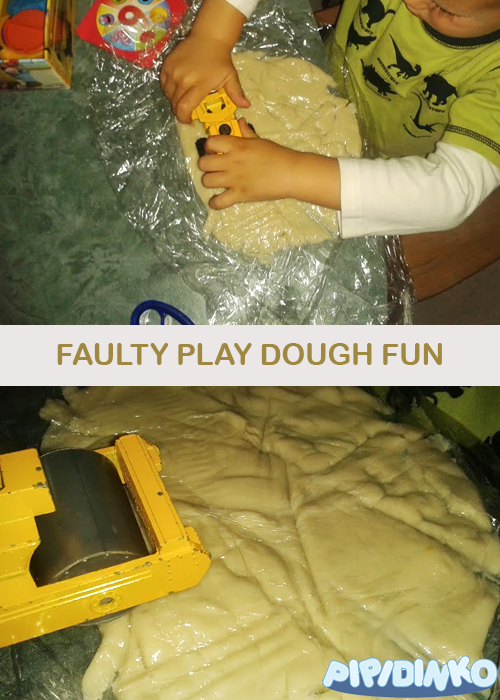 I can't make play dough! Help! Seriously, every recipe I tried, for the past few months, including the ones I used back in winder, didn't work. 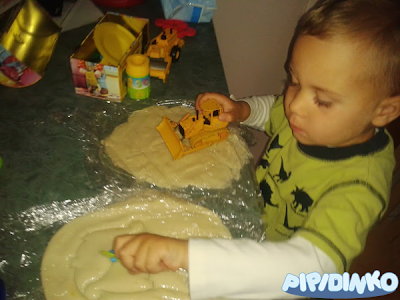 I cook up some good and soft playdough, we play with it, then, after a night in the fridge in an air tight container, my play dough turns into a sticky mess. Absolutely no amount of flour helps to revive it. This time, before throwing out another batch of sticky yucky playdough, I thought "heck, I don't want all our efforts and products just go to waste! Is there anything I can do?" I took some, and put it between 2 sheets of cling wrap. Actually, I just folded a long piece of cling wrap, and stuck the yucky disappointment in the middle. It worked wonders! The cling wrap held up pretty well. 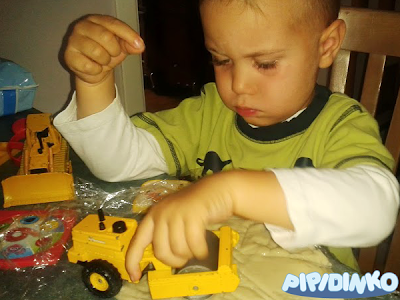 I let Santino play with it, "cut it" with the plastic knife and work it with the toy construction machines. It stayed in one piece during the play, turned out to be very manageable, easy to make impressions, and smooth them out again. 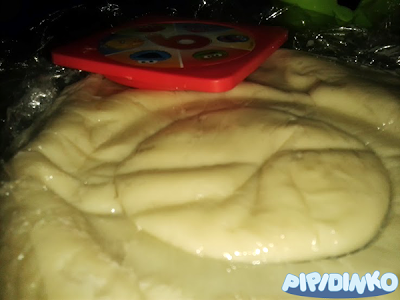 After playing with it, I folded the wrapped playdough and put it in the same air tight container, back into the fridge. I'm sure we will get a few more plays out of it before the plastic rips. 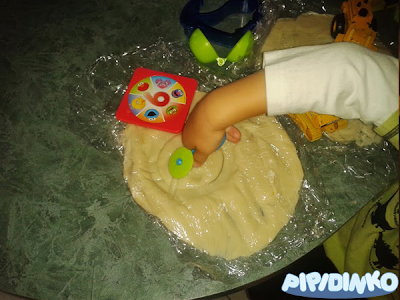 A little tip: don't put too much playdough. 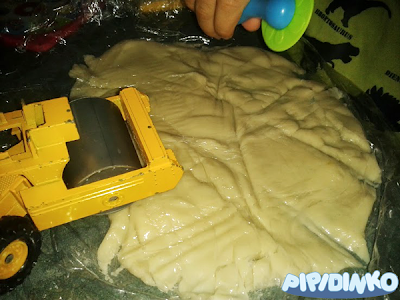 Keep it puffy, but if there is too much of dough, the plastic wrap will rip faster. I made another "sheet", which turned out a little more puffy, and it didn't last long.